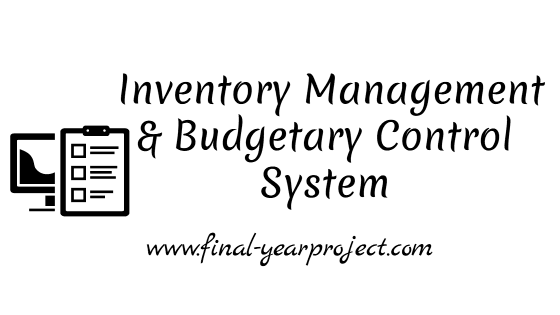 This is a good MBA finance project on inventory management and budgetary control system at Mahindra and Mahindra Co. Ltd. The project is done for two months summer training. The steps involve in collection of data from various sources like SAP, Monthly performance review meetings (MPRM) Reports, Annual Reports, Computerized Inventory Management system (CIMS). The study of budgetary control system help business to function with planning which is related to production, sales, stocks, requirement of labors, etc. You can also Subscribe to FINAL YEAR PROJECT'S by Email for more such projects and seminar. Inventory management is the base for any production unit so; it is related to overall objective on the firm. This study is basically concerned with inventory management techniques. This aspect covered the determination of the type of control required & Economic Order Quantity which help the financial manager in planning & budgeting inventory. This project helps to minimize the cost of holding the inventory i.e. ordering cost & carrying cost. The maintenance of inventory also helps a firm to enhance its sales efforts. It serves to bridge the gap between current production & actual sales. The objective of the project report are the basic responsibility of the financial manager is to make sure the firm's cash flows are managed efficiently, the objective of inventory management consists of two counterbalancing parts: (i) to minimize investments in inventory, and (ii) to meet a demand for the product by efficiently organizing the production and sales operations, these two conflicting objectives of inventory management can also be expressed in terms of cost and benefit associated with inventory. Use only for your reference and study work only.